Zanzibar reminds me a lot of Bali. Not only because it is touristy, but because the islands are really famous compared to the rest of the country; Tanzania. For example most people have been heard of Bali, but many can’t hide their puzzled face when I say I come from Indonesia. “Yes we know Bali! So where is Indonesia in relation to Bali?” It’s probably one of the most common follow up questions I get after I ask them if they know Bali. Speaking of the similarities between the two, Zanzibar also has a lot of things to offer. The islands of Zanzibar, which consists of two big islands and several small islands, are a semi-autonomous part of Tanzania. The two main islands are Unguja Island and Pemba Island. Unguja Island, internationally known as Zanzibar, is where Zanzibar City is located. Stone Town, a World Heritage Site by UNESCO, is the old part of Zanzibar City. While I haven’t had the chance to visit Pemba Island, I spent a reasonable amount of time in Unguja Island and would like to share some of best things you can do around the island. I’ll split this into two part; Things To Do in Stone Town area, Things to do outside Stone Town or in Zanzibar (Unguja island). Here is the full list. You’ll fall in love with Stone Town when you visit. It is a melting pot of African, Arabic and European culture. The town is a warren of small alleyways and roads that cut between crumbling old buildings. There are plenty of hotels and Airbnbs in the maze of old Stone Town. It is fun to get lost and explore the alleys. You’ll find plenty of local people offering you things, but they never hassle you. Once you say no, they usually pass you by. Forodhani Gardens is on the seafront; in front of the House of Wonders and the Old Fort. The best time to visit and hang out at the gardens is in the afternoon close to sunset. You’ll see plenty of local guys showing off their acrobatic skill jumping into the sea. After enjoying the sunset, and these local guys diving into the ocean, you should head over to the night market. This starts around 6 PM. The night market is a collection of food stalls. There are 4 main types of food sellers: Zanzibar Pizza (it’s like a fried pancake), the Seafood Skewers (and other stuff like falafel, bread, etc), Chicken Shawarma and the Zanzibar Mixed soup (a local soup with potatoes, cassavas, a little bit beef, and boiled egg). Other than that, you’ll find plenty of Sugar Cane juice sellers, a Spice Coffee and Chai seller, and a stall that sells sliced fruits with salt-chili sauce. Our favourite was the Chicken Shawarma and The Zanzibar Mix soup (only 1 seller). Watch out for the fish skewers, many people I met got sick after having the fish (you don’t know how long it’s been sitting there. If you’re going to buy from one of these stalls choose a smaller one as they’re more likely to sell out every night). After 5 months of travelling around India, Nepal and Sri Lanka, one thing that I really missed was a cup of nice coffee. I knew I wanted to try the coffee in Zanzibar because I know East Africa (especially Kenya and oh well Tanzania is Kenya’s neighbor) has good coffee. After several days trial and error trying coffee around Stone Town, we came up with these recommendations for you. The best place to get a coffee is the Zanzibar Coffee House. If you join a tour around Stone Town, probably 85% of the tour guides will bring you here. It serves the best coffee in Stone Town. Our second favorite place was Puzzle Coffee. The café wasn’t very busy, but there were always people passing through. Unfortunately the seating isn’t so comfortable. It is a bit awkward; you know when the table is lower than the seat itself. We also tried Travellers Café, Stone Town Cafe and Resto, and also the spice coffee at the night food market. While many of them are nice places to visit, the coffee could definitely be improved. Well, the coffee at Stone Town Café and Resto is quite interesting if you love strong coffee and don’t mind dealing with small bits in your drink. Another place you can go if you want to escape from the busyness of Stone Town is The Swahili House Rooftop Restaurant and Bar. It’s a good place to go. While I don’t recommend the coffee, their food is good! One of the most popular things to do in Zanzibar is eating. For budget travellers this means a visit to Lukmaan restaurant. The restaurant is clean and spacious and the food is mostly tasty. They provide Arabian and African food. Besides Lukmaan restaurant, there is a small food restaurant two doors up. It is a great place if you fancy some vegetables. They offer several options of tasty vegetables. If you walk from Lukmaan towards Slave Market and take the second left, you’ll find a restaurant named Al Jabry. Their food is also good. It’s a nice option if Lukmaan is busy. For international food you should definitely try to go to La Taverna. It is not the best pizza in the world, but is probably the best Italian in Stone Town. Tip: every Wednesday, they do the promo: buy 1 get 1 pizza. A good deal! I really should also mention 6 Degrees South Bar and Restaurant. Too bad we only had time to visit this place at the end of our time in Zanzibar. 6 Degrees has a cool spot for work on the first floor, there is an area with plenty of fluffy sofas. On the second floor there’s a nice spot to enjoy the sunset. It is like a bar, but it is possible to have dinner here too. Order their seafood! The Calamari is so tasty! Don’t miss out on the Ethiopian restaurant named Abyssinian Maritim. It’s an interesting dining experience and the food was tasty! Plus the drinks… You really need to try the Ethiopian fruit juices. I love the ambiance of the restaurant too. I know this is still about food, but the dinner at the Tea House Restaurant of Emerson on Hurumzi was so special it has to be highlighted. They charge USD 30 per person for the dinner (drinks are not included). It’s a three-course meal with appetizers, main course and dessert. The food was ok, and I would say the slow cooked goat was amazing. Dinner at the Tea House Restaurant is about the experience. It’s a rooftop restaurant with limited seats (they say you have to book early, but I think this is a marketing ploy as there were plenty of free seats when we went). The sunset from the rooftop is great with beautiful views over the port. The waiters are friendly and take time to share stories and explain a little bit about the culture of Zanzibar. At the end of the dinner a live band will entertain you. Highly recommend this, it felt intimate and nice. You should visit the slave market if you visit Stone Town. While I read they built the cathedral over the main section of the slave market (the pulpit is built on the spot where the slaves were sold) there’s a building next door that was part of the market where they’ve setup a museum. The museum is well designed with lots of information about the history of the slave trade in Zanzibar and East Africa (Zanzibar was the main hub for slave trading in the region). When you go into the basement you’ll find a room where up to 50 slaves were stored at a time before they were sold. Other than Slave Market, there is the Livingstone’s House, the Peace Memorial Museum, the House of Wonders and also the Old Dispensary. Though many of these buildings are falling apart, the Old Dispensary has been refurbished and will be turned into a museum in the near future. Stone Town can be really hot. If you’re staying in a hotel without a swimming pool and don’t feel like swimming in the sea check out Tembo Hotel. The hotel charges 10,000 Tanzanian Shillings per person for the permit to use their pool and sun chairs. It is a great way to spend an afternoon. Don’t forget to bring your favorite book with you. I love postcards! Near the Freddie Mercury house, you’ll find the post office of Stone Town (Shangani Post Office). There are plenty of stores around town where you can find postcards. It’s a good excuse to send postcards to your family and friends. It’s one of those things you can easily do when you are in Stone Town. 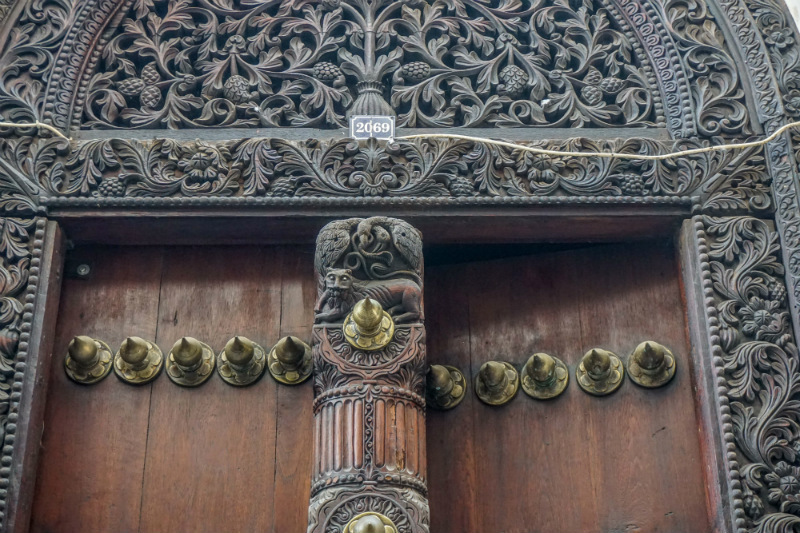 Stone Town is famous for its grand wooden doors. These doors were built at the entrance to the houses of the rich slave traders and merchants. Most of them date back to the 19th century. On the renovated buildings, most of which have been turned into restaurants or hotels, these grand doors are polished and look amazing. Unfortunately the majority of Stone Town’s old wooden doors are falling apart and in need of repair. If you join a walking tour in Stone Town, the guide will usually point out the most beautiful and important doors in Stone Town. Otherwise, in the Freddie Mercury bookshop you can find a small guidebook for 5 or 6 USD about the doors in Stone Town. There are so many shopping opportunities in Stone Town. A lot of the small stalls sell typical stuff such as kanga fabric, dashiki, Masai paintings, and woven bag (it looks like Kenya Jute Sisal Woven Bags). Some of my personal favorites are Kumi Gifts and Treats, Memories of Zanzibar, and Abeid Curio Shop. There are also some interesting stores along Hurumzi Street, though I can’t remember their names. If you fancy to shop for some spices and fresh fruit you can go to Darajani Market. One of the best places to watch sunset is on Stone Town Beach. Be ready for a crowd though. Local people especially young men really love to hang out by the beach and exercise; like playing soccer, doing acrobatics, pushups and sit-ups or just swimming. You can get your typical Zanzibar photo by waiting for the Dhow by the Hyatt. You can also arrange a sunset tour with a Dhow. A tour to Prison Island is one of the most popular day trips from Stone Town. The tour takes about 4 hour. 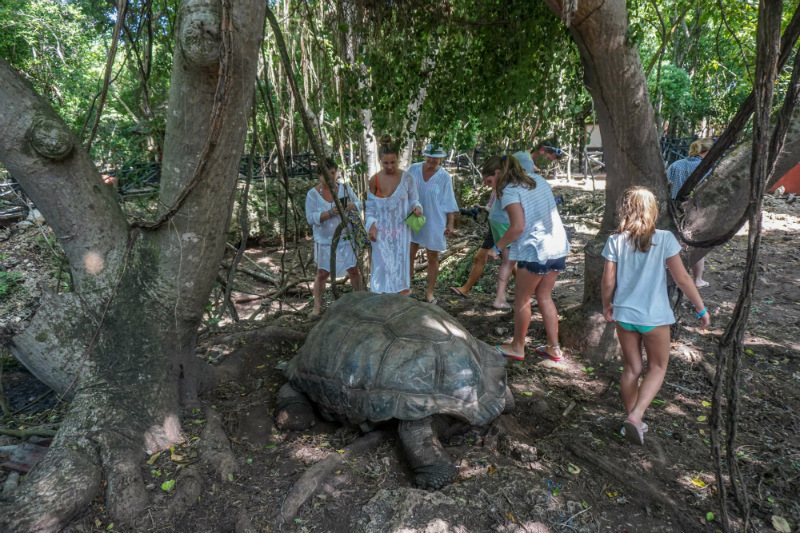 During the trip you’ll visit the giant tortoises in their reserve, explore the island a bit and go snorkeling. The highlight of the tour is the chance to see the giant tortoises, which are pretty damn cute in an old man sort of way. The beach is nice, but the coral reefs are dying and there you won’t see many fish. The tour to the Prison Island (without the entrance) cost us 10 USD per person and 4-5 USD per person for the snorkeling equipment. To get the best deal just simply walk down to the beach and talk to the boatman. In Stone Town they usually sell the tour for 15-20 USD per person. Michamvi is 60-70 km from Stone Town. You can get a taxi or Dala Dala (the minibus from Stone Town to Michamvi. The town is in the east of Unguja Island (the same side with Pingwe, Paje and also Jambiani). There are lots of hotels around here from budget, Milele Lodge through to luxury, Michamvi Sunset Bay Resort. The beaches around Michamvi are not great for swimming, but are beautiful. It’s a great place for some holiday photos. I used to have a picture of The Rock Restuarant as a screensaver on my desktop at work. The restaurant is rated one of the top 10 quirkiest restaurants in the world by CNN. The list as based on TripAdvisor’s list of unique eateries will change your definition of ‘dining with a view’. Check the list here. The Rock is close to Michamvi and a popular spot for dinner (though it is not a great place for sunset). You should make an early reservation if you want to have dinner. It’s simple to do, through their website. Just click here to do your reservation. If you want to have drinks and snack around 3-4 PM, I don’t think a reservation is needed. I really enjoyed visiting the restaurant. The view from the outside decking was beautiful. The drinks were pretty cheap considering (a double gin and tonic was USD 7), but the food is a bit more expensive. Nungwi is in the South of Zanzibar and has beautiful beaches (where you can actually swim). My favourite spot to chill out on is near the Langi-Langi Restaurant. There’s lots of shade here, which is needed in the middle of the day, and the food at Langi-Langi Restaurant is great too. Kendwa is not so far from Nungwi and it’s a great place to swim. If you have a day here I’d recommend walking along the coast from Nungwi to Kendwa. It’s worth visiting on a day trip from Stone Town. If you are in Zanzibar around the full moon be ready for a party! The Full Moon Party usually happens on Saturday at Kendwa Rock. While I never went to a full moon party while I was in Zanzibar, I went to the Busara Music Festival instead, local people told me the party was a lot of fun. If you’re on a budget taking the Dala Dala is a great way to transport yourself from one place to another. For a short distance they usually charge you 400 Tanzanian Shillings. For a longer journey, like from Stone Town to Nungwi, they charge you 1,500-2,000 Tanzanian Shillings. Some of the Dala Dala only have numbers on the front of the bus while others have the destination written down. If you’re confused ask a local person for help. The Busara Festival happens once a year. I was lucky to attend Sauti za Busara 2017 from 9-12 February. The 4-day pass cost USD 120. The festival was held in the old fort by Forodhani Gardens. The artists are mostly from East Africa. Some of my favorite performers were: Bob Maghrib from Morroco, Karyna Gomes from Guinea Bissau, CAC Fushion from Tanzania, Loryzine from Reunion and Madalitso Band from Malawi. You can check the festival’s official website for further info. The other big festival on Zanzibar is ZIFF (Zanzibar International Film Festival). Whenever people say “Mambo”, you should reply with “Poa” and then they’ll say “Habari?” then you’ll reply “Nduri!”. And it goes on… I learned more than 30 words during my stay in Tanzania. And it is no secret local people love you more when you can speak their language (even if it’s just a tiny bit). Zanzibar is known as the Spice Island. It reminds me of Banda Neira, the Indonesian Spice Island. If you want to learn more about spices, having visited Banda Neira I decided I didn’t need to do this, you can join a Spice Tour. It is one of the most popular excursions in Stone Town and around Zanzibar. A lot of people I met talked about the Blue Safari Tour. It’s recommended. From what I heard they have a great time snorkeling, eating seafood, enjoying the sandbank and sailing with a Dhow. It sounds like a nice day trip from Stone Town. If you want to be more active you should try Kite Surfing. I had plans to go, and was invited to join some friends, but was in Dar Es Salaam at the time and never got the chance to join them. Don’t make my mistake… One of the centers for kitesurfing in Zanzibar is around Paje. So that is my long list of things you can do if you visit Zanzibar. I am sure that there are plenty more interesting things you can do. Let me know what you’ve tried, or would recommend in the comments below. yes, I couldn’t agree more, I know Zanzibar but I don’t realize that this is part of Tanzania ahahhahahaha poor me. Iya nanti yaa aku posting lagi soal pintu doang ahhahaa.. *terlalu percaya diri! padahal seringnya males. Itu aku ketemu pas awal festival hari pertama, aku foto mereka karena rambutnya lucu banget. Gemas! Eh, pas hari ketiga tahunya mereka manggung hahaha..
For me its a complete mini travel guide for Zanzibar. Thanks for sharing all the tips and tricks which will help us in trip to Zanzibar. Amazing… This post really mean a lot for me. I would like to enjoy my experience with ZANZIBAR ! I’m excited to be there in ZANZIBAR ! Thanks for sharing this post. Zanzibar is one of the best tourist place to visit and the pictures you’ve shared in this post is pretty. 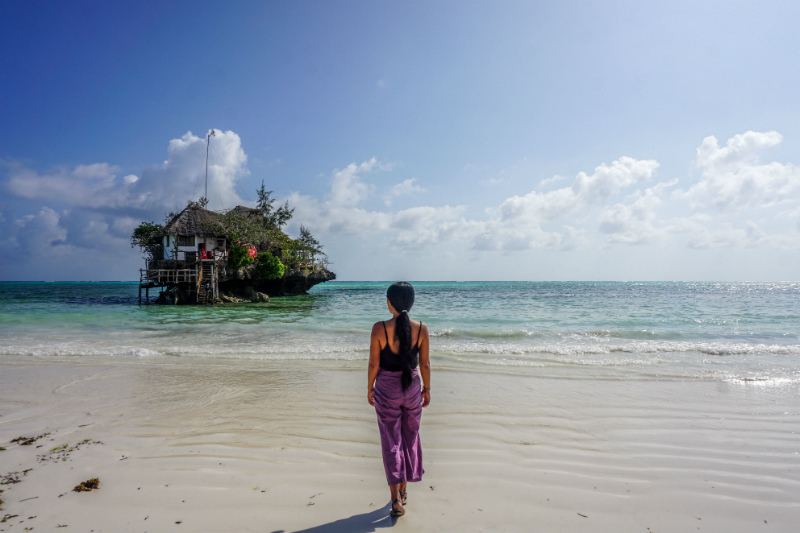 Semoga bisa punya kesempatan ke Tanzania juga ,…..
Zanzibar has never been one of my must-visit destinations, but I’ve changed my mind after looking at your photos! Jaw’s Corner seems like a pretty strange hangout spot!